It can be hard to know exactly how to dress your little one for bed in hot weather. If you dress her too warmly, she might wake up sweating during the night. If you dress her too lightly, she might kick off her covers and feel chilly. Either way, you want to make sure your little one gets a good night's sleep. Dress your toddler in loose, comfortable, cool clothing on hot nights. Choose a material that allows air to flow through easily, such as cotton. 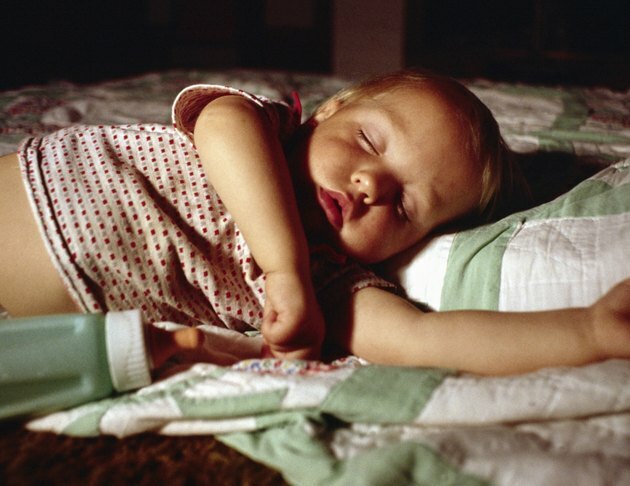 If it's very hot, allow your toddler to sleep only in a diaper (or underwear) and a T-shirt. If you have a timed or temperature-controlled air conditioner, consider allowing your child to keep on socks and perhaps loose-fitting pants as well to help her keep warm as the temperature drops. Remove excess blankets, padding and stuffed animals to keep her bed as cool as possible; a thin sheet should be sufficient. If you have a fan in your child's room, don't put the air flow directly on her, as that can cause her to feel chilled during the night. If you do have a cooling system and your child tends to kick off her covers, consider checking on her once or twice in the night to re-cover her with the sheet or turn down the air in her room. Is It Bad to Take a Baby on a Walk in Winter?